Product information "Zybo Z7-10 Zynq-7000 ARM/FPGA SoC Platform"
ZYBO Z7-20 comes with SDSoC voucher. The SDSoC™ development environment provides a familiar embedded C/C++ application development experience including an easy to use Eclipse IDE and a comprehensive design environment for heterogeneous Zynq® All Programmable SoC. 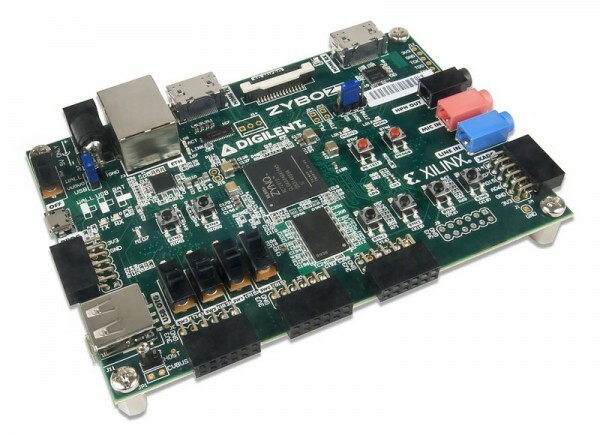 The Zybo Z7 is a direct replacement for the popular Digilent Zybo development board, which will soon be phased out of production. The training materials include the hands-on workbook and project files. It illustrates the viability of real-time video processing in reconfigurable logic instead of software running on a general-purpose microprocessor. Engineers, developers and academia can learn High Level Synthesis (HLS) design flow to configure the field programmable gate array (FPGA), design a video processing pipeline and culminate in the implementation of an edge detection application. Related links to "Zybo Z7-10 Zynq-7000 ARM/FPGA SoC Platform"
Further products by Digilent Inc.